Russia has requested to brief the U.N. Security Council on the results of the Tehran summit between Russia, Iran and Turkey on the fate of Syria's Idlib province, diplomats said Monday. The council is expected to meet on Tuesday at 11 a.m. (1600 GMT) to hear the briefing as Assad regime forces, backed by Russia and Iran, were preparing for an all-out military assault on the rebel-held province. The presidents of Turkey, Russia and Iran met on Friday in Tehran, as part of the trilateral efforts on finding a solution to the Syrian civil war. While the summit underlined that "there could be no military solution to the Syrian conflict" and called for advancing the political process to reach a negotiated solution, no ceasefire agreement was reached. 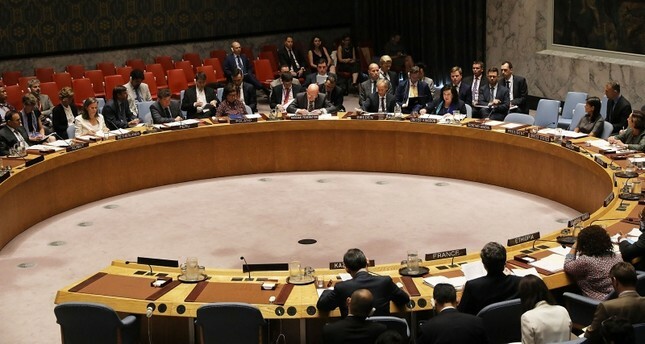 At a council meeting on Friday, Russian Ambassador Vassily Nebenzia defended the military plans for Idlib, saying armed groups linked to Al-Qaeda were "a legitimate target for liquidation." The Russian mission to the United Nations said in an email seen by AFP that the public meeting would be to "brief council members on the results" of the Tehran summit of the so-called Astana guarantors. Turkey and other international actors including the U.S., U.K. and France have repeatedly warned the Assad regime and its backers, Russia and Iran, to avoid any offensive on Idlib due to the possibility of a humanitarian catastrophe that would cause massive casualties and a new migration wave. In an effort to restore calm in the region and improve the humanitarian situation, the three guarantor states Turkey, Iran and Russia launched the Astana process on Jan. 23, 2017, to complement the U.N.-brokered talks in Geneva.